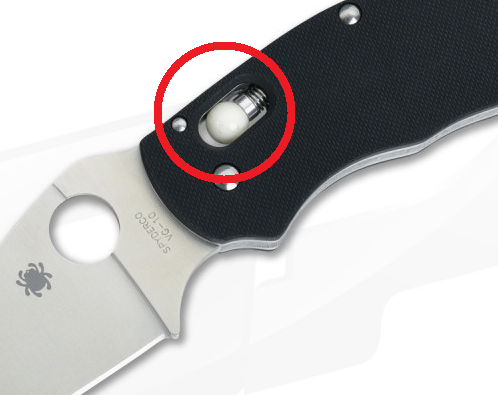 A thought occurred: Anyone make Manix 2 metal plungers? Discussion in 'Spyderco' started by MyLegsAreOk, Mar 24, 2019. The ceramic ball doesn't fit in the Manix 2 so what can we do to get rid of plastic? Metal ball holder/plunger part. Has anyone see one out there? I checked out a russian guy on youtube years back that made a titanium one, but off hand does anyone know where I might get a metal one this day and age? That guy in Russia is the only hint of a metal retainer that I've heard of. I have 6 Manix 2s right now so if one of mine breaks I'll probably try making a metal one myself. Yeah upon googling I found that thread. It's long dead. I'm going to call a couple metal fabs around here and pay to get 100 or so made if that's the minimum. I wonder if anyone will buy them from me. Maybe ebay? I saw that thread that Colorodo linked and really liked the titanium. I'd be interested in a least 2 depending on the price. The plastic cage seems entirely adequate, but I think a metal one would be a nice custom touch. Does anyone think a change in serration style would provide extra grip? Maybe a sort of fish scale look like Smith and Wesson does on a lot of their slide serrations? Another thought would be to have the bottom of the cage flare out ever so slightly to provide slightly more traction when pinching the cage to retract it. Adding just a hair width near the back of the cage might also help. One other thought would be to have the spring guide (the nubbin thing that goes into the spring) be rounded off like the top end of a broom handle. Sell them on the exchange here. I'd love a metal Manix cage. Titanium would be great. Price would have to be right...I guess for me that would be maybe $30-$40 max, less even better. I've thought about this in the past but no one seems to make them...kinda surprised Flytanium hasn't done them. Why do you folks want metal sliding on metal? To me that just seems like a negative. Anyone make Manix 2 metal plungers? I don't care for the Manix but I wouldn't call it a toilette plunger. Going where no one is willing to go these days I submit the unmentionable brand with the Axis Lock. Traded the the Manix for a knife with an axis lock. Then I bought a 710 and a 940-1 and discovered what the ball thing was trying to accomplish. Ball lock : nah dude, nah. Titanium might have to be polished on the inside of the cage where the BB sits wouldn’t it? Does the BB rotate inside the cage as the knife opens and closes or no? In it's defense has anyone had the fiber reinforced "plastic" ball fail ? I haven't seen that in the forum before. I may have heard of the ball or older version slider coming out but that is like one time in several years. There is a thread here discussing the ball lock and "plastic". I'll see if I can track it down; maybe there is a metal solution in that thread. There is a thread here discussing the ball lock and "plastic". The ball is not plastic; only the cage attatched to the spring that holds the ball in place is. It is this cage many people want to replace. Not because the plastic cage is breaking, but because it would be cool. You bought the wrong size. I have for sure seen a pic floating around here of a Ti'ed out Manix including the cage. You not only would have to have a different plunger, but back of the blade needs a whole different contour. I want this ball, but it can't happen so I'm stuck with looking for a metal cage. I bought benchmades exclusively when I first got in to real knives. No thanks. Those contoured scales and the fiddling with the omega and lock itself on disassembly plus those fat blades, I'll skip it. I carry my copper manix 2 with maxamet it weighs more than the contego but I'd rather it than the big m4 benchmade.